I love the return of cold weather for giving me the excuse to pull out all my scarves, boots, tights and adorable berets. The chill in the air signals the beginning of the holiday season, but it also signals the need to pop into my local Sephora to stock up on all my thick moisturizing favorites, like hand cream. I wash my hands a lot during the day and I can’t stand how dry my hands feel afterwards. It’s just this icky, uncomfortable, tight sensation all over and I can’t seem to focus on anything else until I handle it. To avoid the uncomfortable ickyness, I just keep hand creams in every spot possible; my desk, my purse, the bathroom cabinet, the kitchen sink, I even have a big bottle on a table in my foyer, in case I need a little moisture on my way out the door. 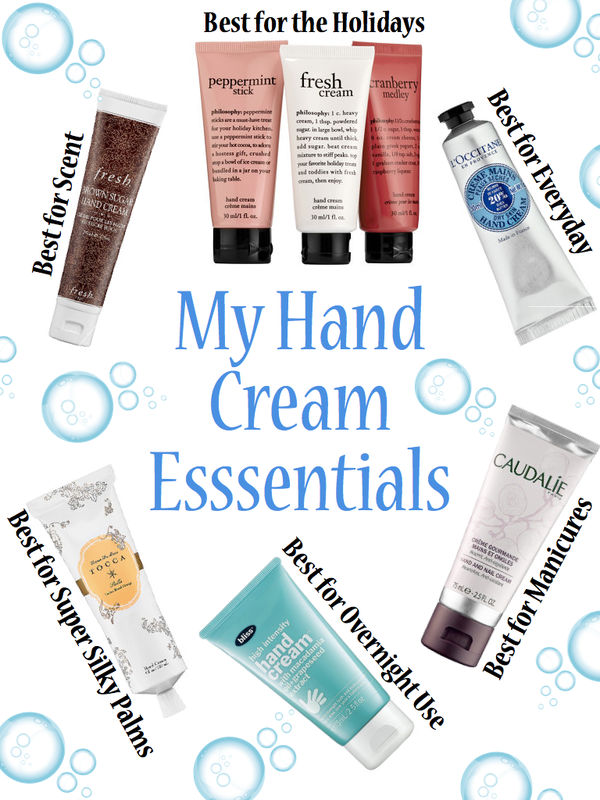 With all those spots to stash a hand cream, I’ve definitely developed a few that I love. Here are some of my ‘best for’ hand creams to suit your every moisturizing need. Huge fan of Fresh! Ooh and I had the Bliss facial before. Great collection! The L'Occitane cream is one of my absolute favorites – perfectly moisturizing and not greasy. I also like the Bliss hand cream. My hands always get SO dry… I'm going to have to try a couple of these, either the everyday or overnight! My fav (and although it's hard to rub in, it lasts a few hand washes – is the Neutrogena Norwegian Formula…it's like $8 at the drug store. I love cranberry! Oh my gosh that cranberry medley sounds heavenly. I want to smell it now. I'll buy anything that's Philosophy. They have the best stuff this time of year. Um I so needed this! I have the worst dry hands and it just got cold here! I love that LOccitane hand cream! I also like bath and body works shea butter cream. I think it's blue spa something? It's fantastic though! I def need hand cream way more now since we moved to the desert.. i love the l'occitane and that's my go-to right now. I am a big fan of the L'Occitane hand cremes I have them all over! Laptop bag, heck every bag! Office, car, home office – love them! I love Philosphy! They really have the best products! I'm all about scent! Going to have to try the brown sugar hand cream! I want the Philosophy ones. The peppermint would smell amazing! I need to try out the Sophora overnight cream! Philosophy products are my favorite, especially the peppermint scented ones! Thinking I need to try the Fresh one – I'm so picky about scents. But my hands are super dry this time of year so must take care of them! I love hand creams but always find it difficult to get ones that have a lovely soft consistency without leaving your hands feeling greasy! I'll try a few of your suggestions,I love yummy smelling ones!